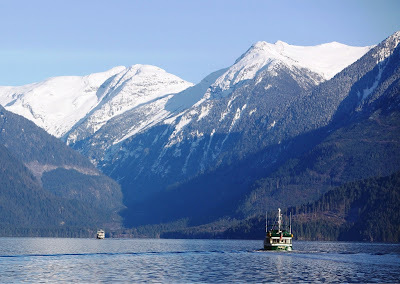 Over the last several winters we've enjoyed a new tradition – New Year's cruising to Princess Louisa Inlet in British Columbia. Each year shortly after January 1st, we make our way north to Vancouver BC. 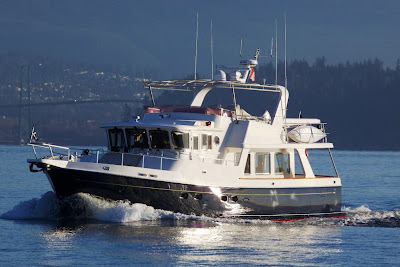 As soon as the weather permits, we motor northwest along the BC coastline to Pender Harbor, then easterly, eventually arriving at Princess Louisa. Being from sunny California, we're always hoping for snow and ice. In 2009 we saw lots of snow and “margarita” ice. (See Cruising PLI in Winter from the January 2009 entry). Last year it just rained a lot and we didn't see snow or ice. This year we had it all: rain, snow, and thick ice! Here’s the story. We flew in from California last evening and got an early start today for the 8-hour motor to Vancouver. Leaving at 6AM from Anacortes, the first 90 minutes of boating was in the dark. We hoped to avoid the deadheads and floating logs so prevalent in winter, and as it turned out, Lady Luck was with us. For the first time ever, and even though we had on the satellite TV, Pat did not watch the Rose Parade, deciding instead assist in deadhead watch. The seas cooperated for most of the day, except on approaching Point Roberts where a following current and NE winds produced a nasty chop for about an hour. 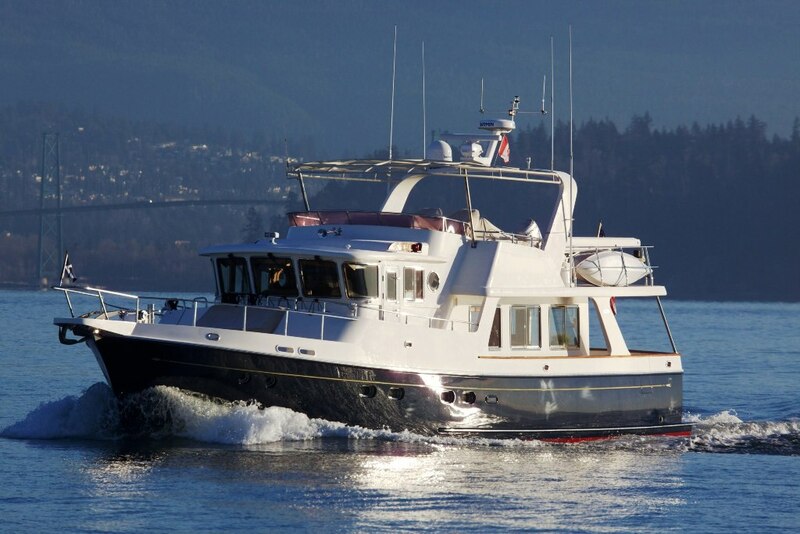 Once we cleared Tsawwassen, it was smooth sailing into False Creek and Canadian Customs. Upon clearing, we moved over to our favorite moorage, Quayside Marina in downtown Vancouver’s Yaletown district. Vancouver was cold but not layered in snow like 2009. This winter cruise has turned out a small fleet. Wild Blue has been joined the Selene 48 Z-Worthy with Ron and Bonnie from Seattle, and by the Selene 50 Seeker with Mike and Susie from Shell Beach, California. The crews gathered at Quayside’s Provence restaurant for cruise planning, and more importantly, a wonderful dining experience. Fresh water is difficult to find in winter. 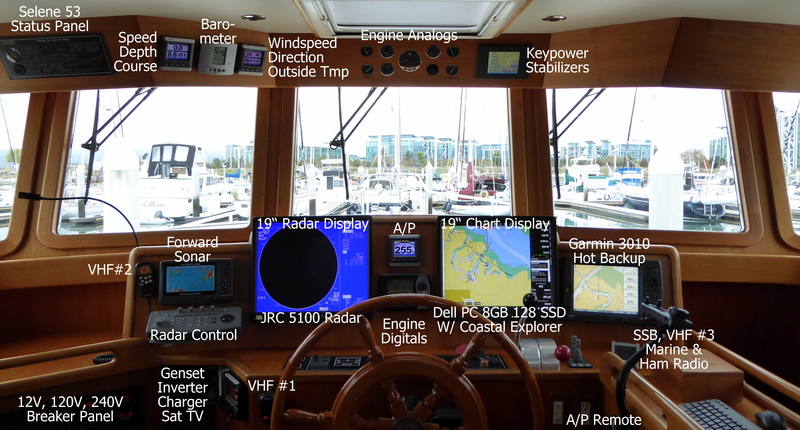 Most marinas winterize their water lines, which means among other things, the water has been shut off. Seeker needed fresh water and luckily found some running at the False Creek YC. Once her tanks were topped off, the boats started their northwesterly journey about 9AM. 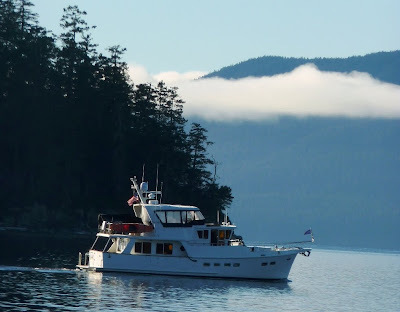 It was sunny skies and picturesque scenery along our route to Pender Harbor. Wild Blue leaves Vancouver with First Narrows Bridge behind. The boat looks different in winter without its canvas top. As easy as it was getting to Pender Harbor, entering the Garden Bay Marina proved to be a small challenge. There is a fresh water creek that empties into Garden Bay, and as you probably know, fresh water floats on top of saltwater. When it’s cold enough the fresh water freezes. 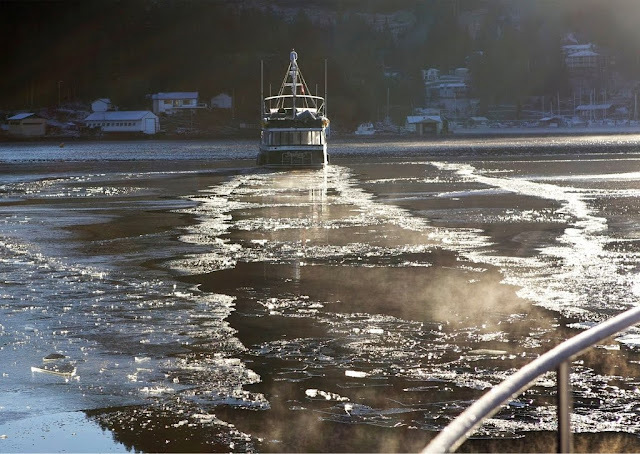 As Wild Blue maneuvered towards to the dock at the north end of the Bay, the ice thickened to about ½ inch. It was good that an RCMP Police boat was just in front cutting a path through the ice; but it was bad that the Police boat was so skinny. The beamier Wild Blue crunched the path about 4 feet wider, causing ice piles to mark the route for Z-Worthy and Seeker. It’s a noisy experience and the Admiral (Pat) was ordering the Captain to reduce speed. We noticed the boats behind closely followed our lead, not wishing to be trail blazers. Once inside, we all turned our bows south and moored to the dock, deep inside the Bay, near the running creek, ordered first in - last out. Let’s hope for an ice-free exit tomorrow. It was the Garden Bay Pub’s last night until their late spring re-opening, so the place was jumping and the dinner portions were large. We enjoyed our burgers, fish and chicken then retired for a long days cruise to the Inlet tomorrow. Besides weather, the other thing limiting access to Princess Louisa Inlet is its small opening. This S-curve-like entrance, known as Malibu Rapids, is just 100-feet wide, shallow, and the tidal current can reach upwards to 15 knots. So it is important to time your entry near slack tidal current. The Rapids slack current over the next several days occurs near and after sunset, so we wanted to be at the entrance long before sunset. As we leaned on last year’s winter cruise, transiting the Rapids in the dark is a bit spooky! It’s about a 4-hour cruise from Pender Harbor to the entrance and with slack water projected to be at 4PM, it made sense depart around 11AM. 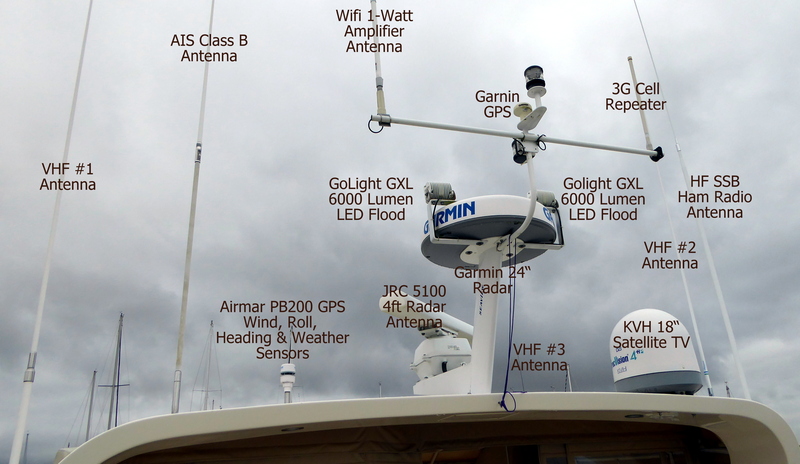 Lucky for Wild Blue and Z-Worthy, Seeker was lead boat leaving the marina. Overnight the floating fresh water had frozen again, creating a ¾ inch thick ice sheet. Susie on Seeker was not happy about being the trail blazing boat for the first 200 yards of our cruise today. Creeping at 1 knot, Seeker noisily crunched ice to clear water. As a badge for Seeker’s trail blazing, the ice wore off the first 12 inches of her bottom paint, exposing the blue barrier coat. “Seeker on ice.” Hey that’s sounds like the name of a tasty new cocktail! Seeker cuts a path through the ice. ¾-inch ice chunks along Seeker’s wake. 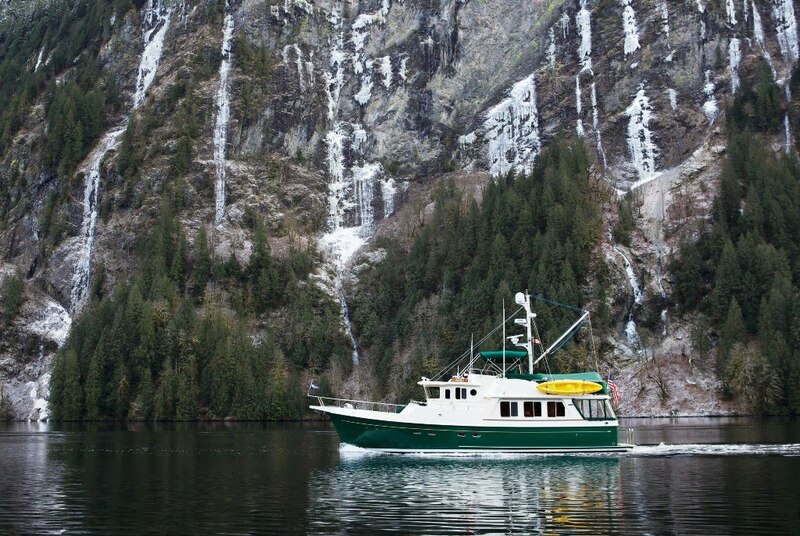 This scene was repeated later in our journey once inside Princess Louisa Inlet. Z-Worthy and Wild Blue closely followed Seeker’s lead and soon clear water prevailed. Ice free waters and sunny skies smiled on the fleet along our route up to the approach to Malibu Rapids. 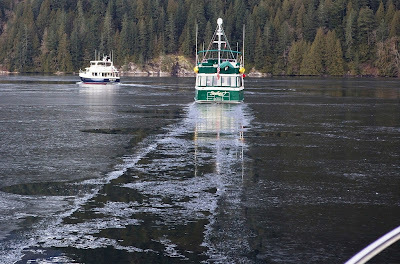 Ice reappeared on the approach to Princess Louisa about 2 miles out. Wild Blue led the fleet doing its part in ice breaking. 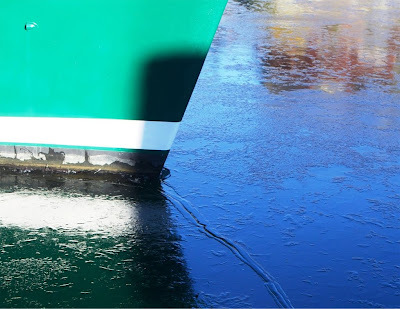 This ice was less than ½ inch thick and required slowing to 3 knots or so at times. We arrived at the Rapids about an hour before high slack current. Since the difference from low to high tide was not great, the current was easily managed. We noted that the Rapids were ice free, probably because of the constant water flow. During our January 2009 Winter Cruise, thin ice and snow blanketed the Inlet at the entrance. The ice and snow thickened as we approached the Falls. But that was 2009. Today, once past the Rapids into the Inlet, there was no ice and clear waters as far as we could see, or about 1 ½ miles. The fleet looked forward to unrestricted passage to Chatterbox Falls. The ice started at 2 ½ miles into the Inlet. From a distance, the ice field looked like a large, loose kelp bed. But soon we were into ½-inch ice with 1 ½ miles to go. At 1 mile the ice thickened even more. This was solid ½ to ¾ inch thick stuff. As the ice thickens, the breaking ice noise increases in volume, and the broken ice chunks increase in size. The boat vibrates and slows dramatically. One knot boat speed, or less, reduces the vibration and noise. Surveying the water ahead caused us to change course several times. Similar to our experience in Tracy Arm, Alaska, the ice around the edge of the Inlet seemed to be a bit … less-thick. After what seemed like many hours, but was more like 60-minutes, we arrived at the Falls and tied to the float. With Wild Blue in the lead, the rest of the fleet just needed to “stay in the ice lane”. When out of the lane, you do get instant feedback: a loud grinding sound. Z-Worthy and Seeker arrived at the float, admiring Wild Blue’s bow, which had its bottom paint rubbed away for almost 3 feet. Wild Blue cuts a path through the ice. 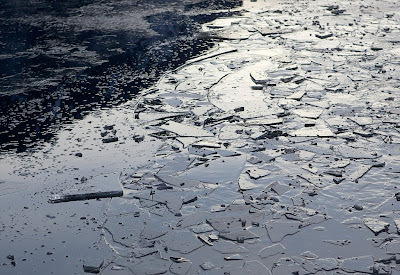 Video: Thick ice means large ice chunks and loud noise. Since the chunks are small, this is the thinner stuff. Tuesday and Wednesday, January 4th and 5th. The fleet stayed for two nights enjoying hiking, dining and socializing. We built a fire in the park's tepee and roasted hot dogs. On Wednesday we eased away from the dock about 9AM to make slack water at the Rapids. By now the temperature had risen to a point that thick ice had melted and only ice slush remained. 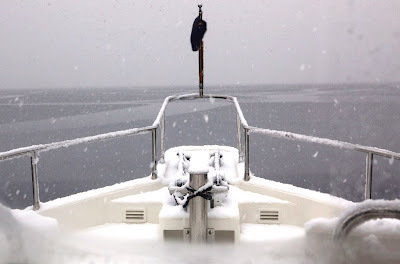 As we neared the rapids it began to snow completing our trifecta goal: rain, ice and snow. 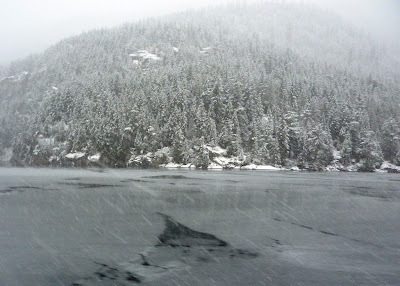 Snow begins to fall in Princess Louisa Inlet. 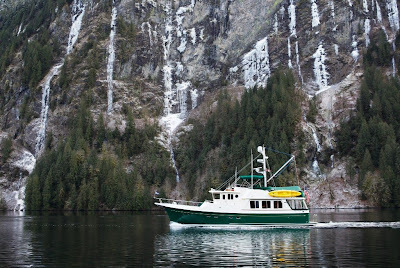 We made our way back down Jervis Inlet, past Pender Harbor, and entered the hopefully ice-free port of Secret Cove. Although the big wind was making our docking maneuvers trickier, we prevailed and Proprietor Scott Rowland welcomed us again. We snacked on Seeker's famous scones then dined on Wild Blue's hunters stew. It was a great cruise and the fleet enjoyed fair winds and following but flat seas back to Howe Sound and Vancouver. The fleet is looking forward to next January's PLI cruise. Credits: Almost all the beautiful, in-focus, crisp and colorful photos are from the hand of professional photographer Ron Zuckerman of Z-Worthy. A few fuzzy photos and all the boring videos are from the shaky hand of the amateur author.